Shane Blodgett and I went to the Ridgewood Reservoir, in Queens, yesterday morning before dawn. Our goal was to listen for nocturnal birds, as well as, any frogs that might be calling. Steve Nanz and Heidi Steiner (and little Veery, of course) met us there at 5:30AM. When we arrived, it was not possible to listen for frog calls as the collective din of bird song (the dominant voices being robins) drowned out any, less enthusiastic vocalizations. We departed by 7:30AM and had identified two more species for our cumulative survey list; Ring-necked Pheasant and Common Nighthawk. A surprisingly diverse warbler list for this date included a singing Hooded Warbler, who has been present at or near the same location for at least 2 weeks. Besides Yellow Warbler and Common Yellowthroat, there is a fair possibility of other warbler species breeding at the reservoir. I really enjoy being outdoors observing nature during any season. On the other hand, hanging around swarms of Mayflies (now present at the reservoir) is not very high on my list of fun activities. Of course, the warblers, flycatchers and dragonflies at the Ridgewood Reservoir probably wouldn't agree with me. A few minutes before the sun peaked over the horizon, we began noticing dragonflies emerging from the wall of phragmites that encircle the lake. My first impression was that the insects were craneflies by their slow, fluttery manner of flight. One landed on Shane's arm and we saw that they were a species of dragonfly. Steve is very familiar with our local dragonflies, but by the time he arrived, they were no longer migrating up from the lake habitat. We located several of the insects and he was fairly certain that they were Blue Dashers. He also explained that we were witness to the post-emergence maiden flights of a mass (flock?) of dragonflies. I wouldn't even venture a guess as to how many were taking flight for the first time. I'm just beginning to learn about dragonflies and Steve pointed out several other species seen in good numbers for the first couple of daylight hours. While it was still dark, I noticed that something new was blooming and my eyes and lungs didn't like it. Within the last week I had been noticing that just about every locust tree was enveloped in clusters of white, dangling flowers. But I only began feeling an allergic reaction that morning. By 6AM the sun was out and we started a slow loop around the outside edge of the reservoirs. Along some stretches of the asphalt sidewalk that surrounds the reservoir, the ground was blanketed with billions of tiny, green specks. They were actually flowers and each one was so miniscule that the accumulating layer of lime looked more like pollen than petals. Could I be allergic? At home I learned that they were the blossoms of Climbing Bittersweet vines and their nearly invisible flowers are a mere 4mm wide. In some areas, they drape the reservoir's fencing in thick masses intertwined with Oriental Bittersweet, Poison Ivy and Multiflora Rose. On the opposite side of the path from the fence, stretches of open ground were sprouting thickets of mixed grass. The tallest stalks were bending under the weight of new flowers. I've tried to identify a couple of the species from my photographs, but it hasn't been easy. It doesn't help that their florets are not even recognizable to me as blossoms. Then it occurred to me; grass flowers - grass pollen! I felt a little better knowing that it was likely the grass pollen that had been making my eyes itch. Who am I kidding? It didn't make one bit of difference, I closed the windows, turned on the air conditioner and looked at pictures of the grass flowers. On our first night noise survey at the reservoir we got started a bit later than planned and only had a brief period of time for listening before daybreak. We hope to have time within the next 7 days to give it another shot. Shane dropped me off at home and, from there, my wife and I cycled to Green-Wood Cemetery. The cemetery was having a special Memorial Day event in recognition of Civil War Veterans. It was the culmination of 5 years of research locating forgotten veterans buried at Green-Wood. 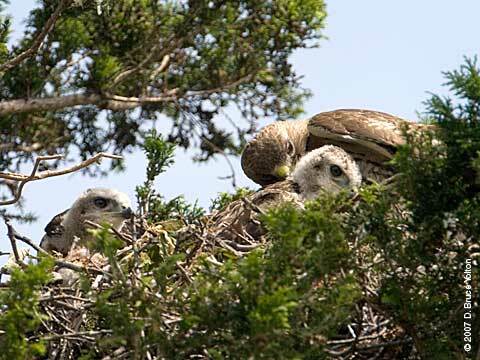 In addition to our general interest in history, I was concerned about the red-tails that were still in the nest. Marge and I had been discussing the issue for the last month, I just did think I should post anything about it here. As part of the event, there were many Civil War re-enactors playing different roles. Among the soldiers, wives and sharpshooters was an artillery unit. That unit had two authentic canons...which would be fired several times. I realize that urban Red-tailed Hawks have probably adapted to the noise and activity of a busy city, but canon blasts aren’t something that they (or we humans) hear everyday. Positioned only 400 yards from the two young birds, I was afraid that the noise might scare them right out of the tree. My wife and I were seated in front of the podium, which was approximately 250 yards southwest of the nest. We were positioned so that I could watch the activities, as well as, Big Mama, who was perched at the top of a cedar tree opposite the nest. I also had a partial view of the nest. Bruce Yolton was taking photos on the hill right below the nest. When the first canon shots were fired, Big Mama was so startled that she looked as if a gust of wind swept her from her perch. She flew directly to the nest tree, where she stayed for the duration of the ceremony. From my ear's perspective, the noise level really wasn't too excessive, but the physical percussion was intense. The tremor caused by the exploding canons was so substantial that each firing caused dozens of the pendular fruits on surrounding linden trees to shake from their branches and spiral down on us like tiny helicopters. After 4 or 5 canon volleys (over an hour period) we saw something amusing that, apparently, none of the dozens of media personnel present observed. During a presentation honoring a regiment of sharpshooters killed in the war, a re-enactment group in full uniform and with muzzleloading long rifles marched to an area behind the podium. There is a sprawling European Linden tree on the hillside, several yards behind the podium. On command, the soldiers loaded their weapons, pointed them towards the linden and fired. Seconds later, Junior flew out of the Linden Tree and off in the direction of the antenna tower. I lost sight of him when he flew behind some trees, but he didn't seem like he was in any hurry. He had been perched out of sight, but only about halfway to the top of the tree, so he was pretty noticeable when he flew. After the ceremony we walked up the hill to the nest and met with Bruce. He told us that the eyass seemed to ignore the canon blasts. I wish I could have said the same about me. The young nestlings are now close to, or at, brancher stage. That is when they begin to climb around on limbs outside of the nest. It won’t be long before they make their maiden voyage. As we were walking towards the exit along the top of the hill, the "Blue Angels" streaked overhead in a "Missing Man" formation. It seemed like a fitting finale for the morning's Memorial Day event. Listen to an NPR broadcast about the event here. Bruce walked back to Prospect Park where we met and I brought him to Alice and Ralph’s nest. Had I just e-mailed him directions, it would have been unlikely that he'd find their well hidden nursery. Their nest's placement is more similar to one in a dense forest than most urban sites. Once at the nest, he was thrilled to have been able to see both eyass. It brought his total for young nestling Red-tailed Hawks seen this season to an amazing 14 individuals. My long day continued after I had given Bruce a brief tour of Prospect Park and pointed him towards the subway. You can see more of his photos and read his posting about the Prospect Park nest here. As sunset approached, my wife and I climbed the stairs to our rooftop to relax, look out over lower Manhattan and drink a glass of wine. You would think that, after beginning the day birding at 4AM, I'd leave all my birding gear in the apartment, but I didn't. As the sky changed from blue to pink, I noticed a large, dark silhouette on the top of one of only two tall buildings across from Prospect Park. Looking through my scope I could tell that it was one of the juveniles red-tails. The relatively tall structure had always been a favorite perch for Big Mama when she called Prospect Park her home. Today it is being used by the pair of juvenile Red-tailed Hawks that were observed building a nest near the north end of the park. I focused my scope on the young hawk and snapped off a few very grainy images. Do you think she goes up to the roof to enjoy the sunset, too? My wife and I went into Prospect Park to check on Alice and Ralph's nest. We were only there a few minutes when we spotted a patch of white fuzz moving around near the far side of the nest. He eventually popped up his small head. It was a brief showing as he seemed busy, either eating or preening, and kept his head down. The lighting was great but I was only able to take a few, partially obscured photos of him. By around 5:30PM I had stopped paying attention to the hawk nest and was leaning on a tree watching a catbird, who was in a tree watching us. My wife, who had continued monitoring the nest, suddenly exclaimed, "There's a second one!" 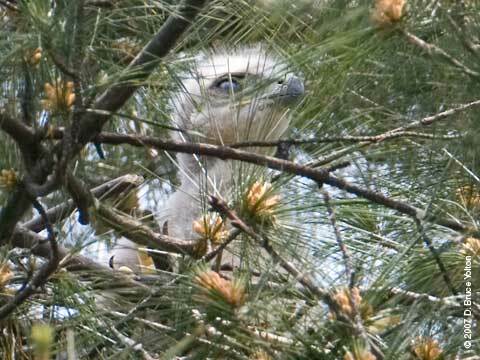 Apparently, the nest at the top of the pine tree is much deeper than I thought and easily hid two chicks. We stayed another 30 minutes. I think, secretly, we were both hoping to see a third. I had assumed that this was a late brood for Alice and Ralph. Based on what, I can't be sure, maybe just poor memory or comparisons to recent images on other hawk-blogs ("hawgs"?). I have hawk photos taken during different periods of development, unfortunately the dates are somewhat erratic as I can only visit the nests when my schedule and the weather permits. I would love to see a series of Red-tailed Hawk photographs taken at specific intervals of time and from a biologist's perspective. It sure would make the process of estimating a nestling's age much easier. 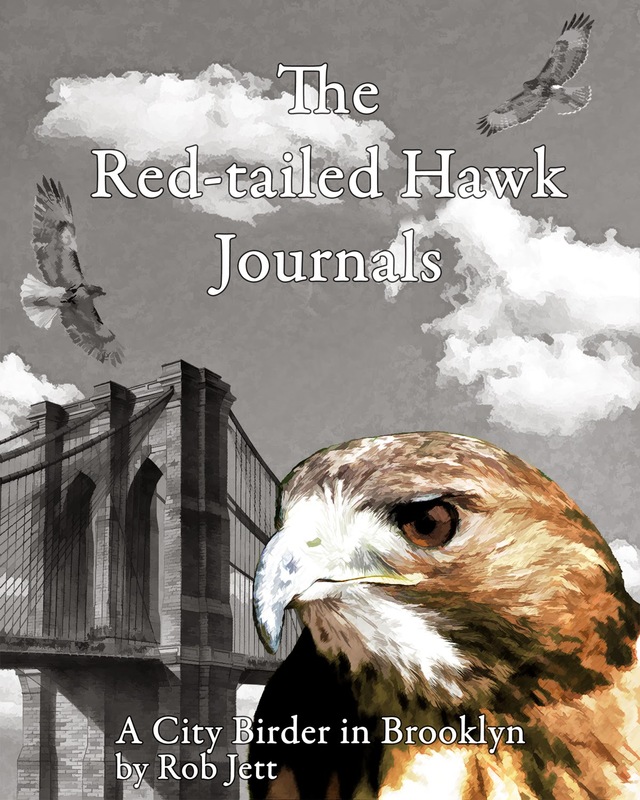 Now that there are several New York City "hawgs" online, lots of data regarding our growing Red-tailed Hawk population is getting shared. It seems that each family may have their own breeding schedule. I doubt that there is huge disparity in those dates, possibly only 2 weeks in either direction. Nest location and food sources probably play a role in each pair's decision to begin the cycle. The top photo, of the set below, was taken Saturday at the Ravine nest in Prospect Park. Below that is a really poor photo of one of Alice and Ralph's offspring taken on June 4, 2006. If my memory has even a shred of reliability remaining, I would say that in 9 days Alice and Ralph's offspring will look very similar to the 2006 image. As an example of another hatch schedule, the final image is of the Green-Wood Cemetery nest taken on 05/22. 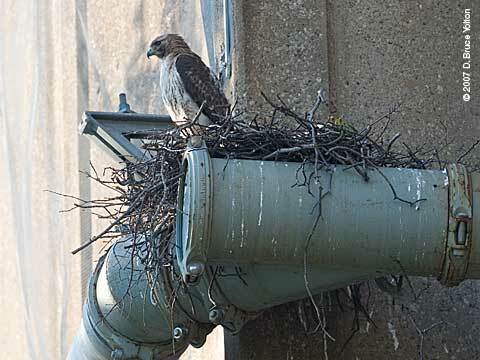 "Yesterday, Ben Cacace and I followed up on a report from Jules Corkery (via Marie Winn's blog) of a new Red-tailed Hawk nest in Astoria Park, on the Triborough Bridge. We can confirm that there are two eyasses at the site. The nest is located on the southern side of the Astoria portion of the bridge. The nest is easily accessible via public transportation. The Astoria Park site is a short walk from the second to the last stop on the N/W line. Except for the stairs up and down the elevated line, it is a nice flat six block walk. Take the N or W to the Astoria Blvd. stop, exit to Hoyt Avenue South and walk towards the river. At 21st Street is the entrance to Astoria Park, walk in and go to the middle of the tennis courts. Look over to the bridge and you'll see the nest on a drain pipe." I had a feeling it was going to be a productive morning at the Ridgewood Reservoir. As we crossed the street from the parking lot towards the reservoir I spotted a cuckoo in a Black Cherry tree. Cuckoos are solitary birds that I usually only locate either through their calls or, as in this case, by pure luck. The bird at the reservoir was a Yellow-billed Cuckoo and he just happened to fly through my field of view and land. The songbird migration has slowed noticeably as the abundance and diversity of wood-warblers has declined. Replacing them is a greater variety of flycatchers. Today our group observed or heard Eastern Wood-Pewee, Willow Flycatcher, Great Crested Flycatcher and Eastern Kingbird. In addition, there were two or three White-eyed Vireo present in a location where we observed them last time. White-eyed Vireo have one of my favorite songs. I suspect that it might have something to do with the mnemonic that many birders use for this tiny bird’s vocalization - “Quick, bring me the beer check”. The profusion of crabapple and sassafras flowers that adorned the edges of the trails and basins during our last visit have had their moment in the sun and been dispersed. Autumn Olives are the prevalent bloom of the current flowering cycle with black cherry and locust trees coming up quickly. I noticed a pink honeysuckle shrub near the reservoir that stuck out among the city’s ubiquitous pale-yellow and white varieties. Jennifer and I climbed down into the “bog” enclosure to survey any breeding species in that habitat. American Robins seemed to be all over the place. In one location we found two active nests that were separated by approximately 40’. We were fortunate to see a feeding at both nests within seconds of each other; one nest had three hatchlings while the other had two. Apparently, robins are very tolerant of their neighbors. Every year, during the early spring, I witness ferocious attacks and aggression between competing males, such that, it’s hard to believe that they would ever coexist peacefully. Jennifer and I quietly approached the nest cavity where, two weeks ago, Steve and I had witness a pair of Black-capped Chickadees hard at work. The hole is in a birch stump only a few feet above ground and, if there was a bird on a nest, I didn’t want to alarm. I peaked in from around the back of the stump, but couldn’t see anything. Jennifer, who is much shorter, looked in from the front. I saw her break into a smile and I motioned her to walk away from the stump. She told me that there was a chickadee sitting on a nest and, despite our attempt at stealth, was aware of our presence and was craning its neck to peer out at her. cheerful, chattering calls. Chimney Swifts are one of the few birds who have benefitted from human development. They begin arriving during mid-May and take advantage of our building's various vents, shafts and chimneys for their colonial nests. Then, one day in the fall, I notice that they've vanished as suddenly as they appeared in the spring. Warbling Vireo’s up-slurred song was heard everywhere within and around the reservoirs. From high perches surrounding the basins, several Baltimore Orioles produced their detached but rich whistles all morning (and probably the afternoon). I was very pleased to hear a Wood Thrush singing from within the reservoir’s yellow birch forest. It indicated the possibility of a breeding pair, but selfishly, I just love listening to their rich, self-harmonizing vocalizations. Donald Kroodsma, author of “The Singing Life of Birds”, describes the thrush’s singing ability during this excellent interview on Voice of America Radio. As I noted in a previous posting, one of the morning’s highlights was sighting a juvenile Red-shouldered Hawk perched in the adjacent cemetery. At the time, we did not know its identity, but Steve’s photos help track down that info. On Monday, Steve, Heidi and I will be going back to the reservoir before sunrise. We plan to listen for the calls of rails, nightjars and frogs. It’s easier to figure out which frogs are present by listening than it is to slog around in the lake ... as much as I enjoy tromping around in muck. I couldn't see any activity on the nest one minute, the next minute I saw an adult Red-Tail soaring overhead, and noticed prey in its talons. It turned out to be Hawkeye, and all of a sudden he just swooped in to the pediment, catching me offguard, and robbing me of the chance to photograph his big entrance. Rose appeared out of nowhere (she was probably in one of the densely leafed trees near the nest), and Hawkeye left promptly. Rose proceeded to tear up whatever the prey item was (small rat? ), and then left herself, without attempting to feed the eyasses. The three of them got out of the nest entirely, exploring the broad cornice of the pediment, and testing their wings. Although it's been a revelation to be able to look down into the nest from the roof of Dealy Hall, it's still nice to photograph the chicks from the ground--it's closer. You get a better sense of the differences between each chick. Just a few more weeks, and they'll be off. Rich Fleisher came into Brooklyn to see the Green-Wood Cemetery nest and to take some photos. I suspect that, by the end of the day, he went home extremely happy. The two nestlings have grow quite a bit since my last visit. They have begun sprouting flight feathers from the edges of their wings. Also, their downy leggings, necessary for warmth as a hatchling, have started to shed. When we first arrived, the two chicks were alone in the nest. Within a few minutes a parent arrived to keep an eye on them. Marge and I still have a hard time telling Big Mama from Junior when they are perched close to us. Their size difference and Junior's peregrine-like facial pattern are more noticable when in flight. In any case, shortly after we arrived, lunch was served. With a gray, fluffy tail hanging over the edge of the nest, it was apparent that squirrel was on the menu. One chick was more aggressive and was fed by his mother until his crop was bulging. The younger chick's needs weren't ignored, but he did spend most of the time in the background. The older chick even managed to pull some meat from the carcass and feed himself a few bites. Soon, their prey will just be dropped off and they'll have to feed themselves. 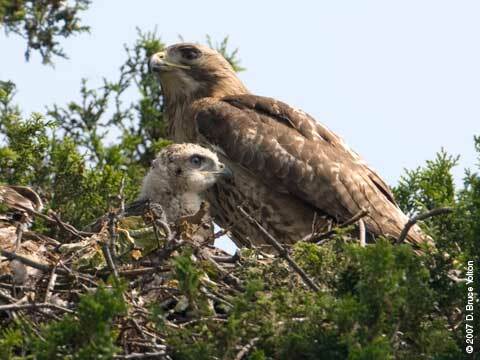 Unlike the Fordham nestlings, the area within the nest seems small for the rapidly sprouting hawks. On several occasions, while practicing flapping, the more developed nestling unintentionally slapped Big Mama and his smaller nest mate in the head. They actually seemed to glare at him with annoyance. If it seems small now, wait another week, when their wings should be completely feathered. On Thursday, May 17th, at about 5:30PM I walked to the Ravine in Prospect Park to check Alice and Ralph's nest. I had planned that it would be my final attempt to look for signs of life. I was pessimistic, given the late date. Shortly after I set-up my scope I spotted a young nestling stretching his tiny wings. I was extremely pleased and presumed that it is the result of a second brood attempt or just the last surviving egg of several. At this date I would normally expect to find a more well developed offspring. 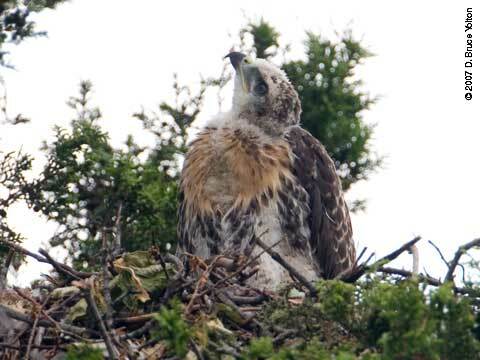 Some of the young red-tails around the city have already attained "brancher" status. The single bird in the Ravine appeared to be at the point in development that the Green-Wood Cemetery nestlings were one week ago; covered with an off-white down and barely able to see over the side of the nest. Unlike Big Mama's relaxed demeanor, Alice was very alert when she was at her nest, glaring at me and following my every move. Periodically, she even raised her hackles if I got too close to the base of the nest tree. Yesterday's windy conditions caused significant swaying of the nest tree and surrounding branches so that I wasn't able to take any photos of the chick. I'll go back in a few days but will stay farther from the nest so that I don't stress Alice. Thank you all for your direct replies, postings and blog comments regarding the "unusual raptor" seen in Queens last week. 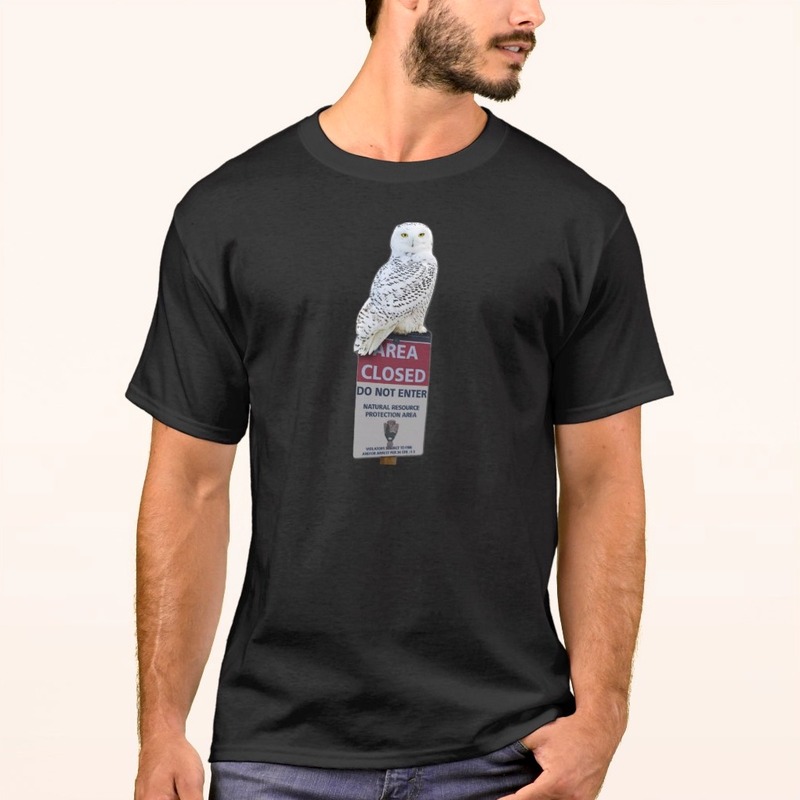 A majority of responses had very convincing arguments for immature Red-shouldered Hawk. A search of the Internet turned up several images of very similar looking individuals. Here is the latest comment with some useful diagnostics. It's an [immature] Red-shouldered Hawk. Just about every buteo species, light morphs, have a malar mark [moustache]. This is not a falcon tell. Your bird is lightly spotted below the bib and has long legs. A Broadwing would have blotchy spotting on the flanks and lower belly; often chunky and short-legged. A bird this lightly marked, if it were a Broadwing, would have a clear, unstreaked area on the upper breast, in between a heavier pair of malar marks! Thanks for posting the images... just can't get enough hawk photos. 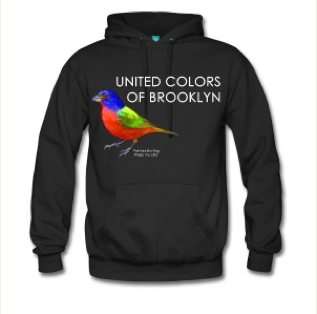 The Brooklyn Bird Club booked Shane to lead a group of birders on a trip to Doodletown. I’ve gone hiking and birding in that area of Harriman State Park several times and really enjoyed the scenery, flora and abundance of breeding birds. I signed up for a spot on the trip as soon as registration opened. It would be the first time since the City Birding Challenge, 8 days ago, that Shane and I would go birding together. Compared to the day of the challenge, the pace would be much slower and total time birding a lot shorter. I really do enjoy the City Birding Challenge, but it’s something that I only have enough stamina for once a year. Doodletown is located along the Hudson River and only about 40 miles (as the crow flies) from midtown Manhattan. When walking along the trails that wind through the forested area that was once a thriving town, it feels more like the backcountry of the Catskill Mountains. 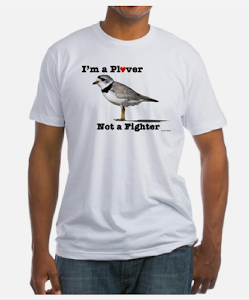 Many city birders make it their destination during the 3rd week of May. Several species of woodland birds that are only seen in New York City’s parks on migration, can be found nesting in Doodletown. One species that is of great interest is the Cerulean Warbler. Their name comes from the latin word, caeruleus, meaning sky blue. They are sublimely beautiful birds who choose a lofty perch from which to deliver their ascending, buzzy warble for, seemingly, hours on end. The bad news is that Cerulean Warblers are in serious danger of extinction due to habitat loss. Several conservation groups have placed protecting the Cerulean Warbler at the top of their priorities. At first, the weather didn’t seem like it would be in our favor. When we began the morning it was overcast and gloomy. On the drive north we passed through some patches of drizzle. Fortunately, shortly after parking the cars in Harriman State Park and ascending Gray’s Hill on Doodletown Road, the storm clouds moved on and it was sunny the rest of the trip. My first bird of the day was a chickadee, actually a pair of chickadees. They were busy at a nest cavity near the edge of the parking area. A few dozen yards beyond the trail Shane pointed out 2 or 3 hyperactive Blue-gray Gnatcatchers feeding in the tree branches above us. At about the same time, we noticed a small flock of Cedar Waxwings perched in a sycamore. I almost always hear waxwings before I see them. Their ultra-high pitched whistle has an omni-directional quality that is usually hard for me to pinpoint. Moments after we saw the Cedar Waxwings, Shane walked over to me and calmly asked, “Do you remember what the three species of birds were that we would ‘definitely’ see during the City Birding Challenge, but somehow missed?” Let me think, Black-capped Chickadee, Blue-gray Gnatcatcher and Cedar Waxwing. There might be a lesson buried somewhere in that bit of serendipity, I can’t be sure. An Olive-sided Flycatcher perched in a crooked snag cried out, “Quick, three beers!” Not a bad suggestion, but I would have preferred the three birds. Two Cerulean Warblers had been reported along a trail just beyond Doodletown Lake. Before reaching the area Shane decided first to detour to another location. It was the former site of an old church. All that remained of the building was the foundation near the center of a grass meadow surrounded by forest. Last year Shane, Sean and I found a Cerulean Warbler at the spot on May 31st. A few yards before reaching the trail that opens onto the meadow, I began to hear the buzzy song of a cerulean. Most of the group was enjoying two male and two female Hooded Warblers a short distance down the trail. Hooded Warblers are striking birds, and we were all thrilled by the sightings, but they suddenly seemed commonplace once everyone learned that there was a Cerulean Warbler in the vicinity. I tracked the singing warbler to the end of a short trail that jutted into the woods on the south side of the meadow. It was actually more of an alcove than a trail. At one point, while watching the brilliant blue and white bird, it flew down from its high perch into a tulip tree sapling only a few feet from the ground. I’m usually the tallest person on a birding trip and, shortly after getting satisfying looks at the cerulean, I ducked out of the way and walked to another section of the meadow. Shane and I were the only experienced ear-birders in the group and I want to give them all a chance to see the bird. By the end of our time at Doodletown we counted 6 male and 2 female Cerulean Warblers. It seemed like a high number, which is good, but we couldn't be 100% certain that some of the individuals weren't ones we had encountered elsewhere. Golden-winged Warbler. Mary first spotted the female bird at about eye level. It was very cooperative and, for several minutes, continued feeding in the shrubs and vines along the edge of the old church’s concrete foundation. In addition to our group of 13, there were several other birders present who “oohed” and “aahed” at the sight of the boldly marked black, white and gold bird. After birding Doodletown, the trip’s agenda called for a visit to a nearby area referred to generically as “Mine Road”. It is in that location that Golden-winged Warblers are usually found. In addition, there is a very specific stretch of road between several numbered telephone poles where a Lawrence’s Warbler has been observed each spring for the last few years. The Lawrence’s Warbler is actually the hybrid result of interbreeding between Golden-winged and Blue-winged Warblers. While searching for a simple definition of Lawrence’s Warbler I came across a “Birder’s World” photo of the week contest winner. The photo was taken “near Bear Mountain” so there is a likelihood that it is the same one from Mine Road. While we were still hiking within Doodletown John Criscitiello noticed a large insect on his shoulder and flicked it off. I looked where it fell and found a freshly emerged dragonfly. John must have brushed against a shrub and inadvertently picked up the hitchhiker. The insect looked like he was struggling on the ground because his wings hadn't yet "inflated" and dried. I gave him a little assistance with a stick, then hung it in a shrub. It was interesting how, after he grabbed hold of the stick, he instinctively assumed a vertical position. At home I looked through the field guide “Dragonflies Through Binoculars” by Sidney Dunkle, but got the impression that it may not be possible to identify the insect while it is still in an incomplete transition state. Maybe some kind of darner? I wouldn’t know a Cordulegaster maculata from a ... well, nearly most any dragonfly. That’s when websites like this come in really handy. Today was the first spring day that I noticed lots of fresh Tiger Swallowtails flying around. One individual that I stumbled on must have emerged very recently as its wings were perfectly formed and vividly colored. He was trying to climb up on a vertical surface, no doubt to allow his wings more time to dry. A tall blade of grass that he was attempting to scale was bending under his weight and he kept getting blown off. I gave him some help and used the opportunity to take some close up photos. After gassing up the cars, we drove the short distance to Mine Road. A narrow border of forest has been cut in most places parallel to Mine Road. The habitat is secessional and primarily composed of grasses, wildflowers, shrubs and a small number of saplings or small trees. It is these open areas at the edge of the woodlands where one is likely to find Lawrence’s Warbler, or for that matter, Golden-winged and Blue-winged Warblers. I forget the exact numbers, but I believe that the annual Lawrence’s on Mine Road is found between telephone poles #139 to #144. Those words look as weird as they sound, but, apparently, there is something special to that particular bird in that area so he comes back every year. It seemed almost too simple. We parked the cars and walked back down the road, checking the numbered plates on the telephone poles. Eventually, we got to the correct area and Mary, the eagle-eye that she is, spotted the Lawrence’s Warbler perched in a Black Cherry sapling. As we walked along that stretch of road our ears were serenaded and eyes dazzled by several Indigo Buntings. They were nearly all brilliantly plumed male birds and were perching on telephone lines, in trees or chasing each other from their respective territories. Blue seemed to be the color of the day as we also spotted an Eastern Bluebird in a clearing near the cars. I’m not sure if everyone in our group got to view the Lawrence’s Warbler. It didn’t stay in the sapling very long and flew back and forth across the road a couple of times until I lost him. We eventually gave up looking and returned to the car. Just as we started back I heard the faint, sibilant “beeee BZZZZZ” song of a Blue-winged Warbler or, as the case might be, a Lawrence’s Warbler. A bit farther up the road is Stillwell Lake. A dam at the south end of the lake is known for its nesting Cliff Swallows. Unlike the typical mud nest of the closely related Barn Swallow, these amazingly agile swallows construct completely enclosed, structures that look like upsidedown igloos. As soon as we walked to the edge of the lake above the dam, we found a few active nests. I’m not sure why, but I found the swallows irresistibly cute when they stuck their heads out of their tiny, mud caves. They evoked an image of a bored kid somewhere in the city, leaning on his elbows and staring out of his apartment window on to the streets below. By the time everybody had their fill of Cliff Swallows (or mosquitos), it was 4:30PM. We stashed our gear and headed back to Brooklyn. The trip was a success in many ways. Shane found the group all the targeted species, and then some. We tallied a respectable number and diversity of birds. If I include the Lawrence’s Warbler, which isn’t technically a species, we observed 72 species of birds. Add to that a wealth of spring flowers, emerging butterflies and good company, and I’d guess that everyone went home tired and happy. This morning, while participating in a survey at the Ridgewood Reservoir in Queens, an unusual raptor was spotted. It was on the high hill to the south of the reservoir and eventually perched in an Ailanthus tree within the adjacent Cemetery of the Evergreens. I tried to get a closer look but the bird flew off. Steve Nanz was able to take some distant photographs, but we still aren't 100% certain of the bird's ID. To me, it looks like a recently fledged Merlin, which begs the question, why would a fledgling Merlin be in Queens? Any help on this bird's identity would be appreciated. If it is actually a Merlin, how or why would it be in Queens? Somebody lose their hunting bird?